We absolutely love the unique style and décor of Karula – in our book it’s definitely one of THE most attractive lodges in South Africa! 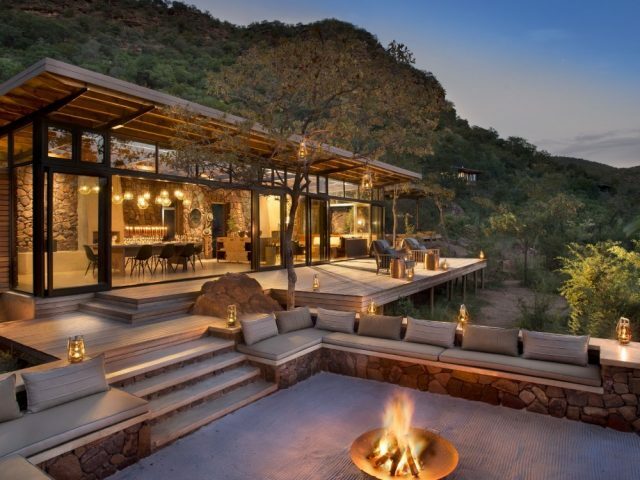 Excellent game viewing and guiding as boasted by all of the other Kapama lodges – that’s if you can haul yourself away from the lodge’s gorgeous embrace that is! 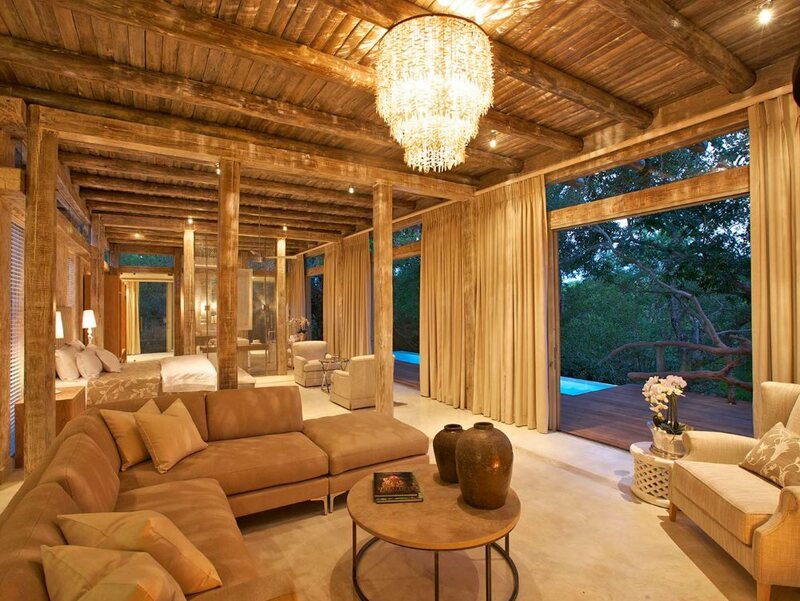 Obviously the priciest of all the Kapama lodges, but what the heck - don’t you deserve to spoil yourself once in a while! 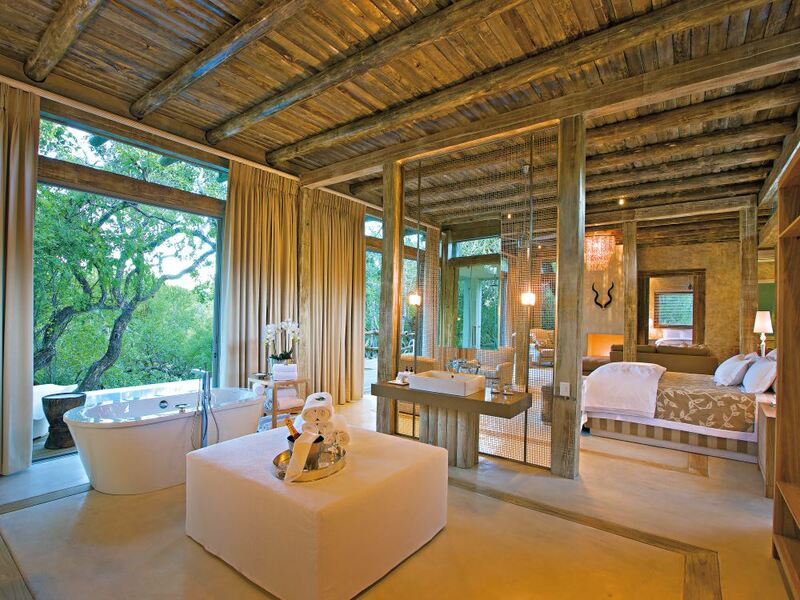 neutral colours, stunning bleached blonde wood and African décor have been fused with subtle lighting and open spaces, making the most of the natural light and views – it all adds up to one of THE most stylish game lodges in South Africa! Set on the banks of the perennial Klaserie River lies one of Africa's most prestigious camps - Kapama Karula meaning “the place of peace”. All year round the river glides smoothly past the camp, the sparkling pools attracting a consistent stream of game not to mention countless numbers of birds! 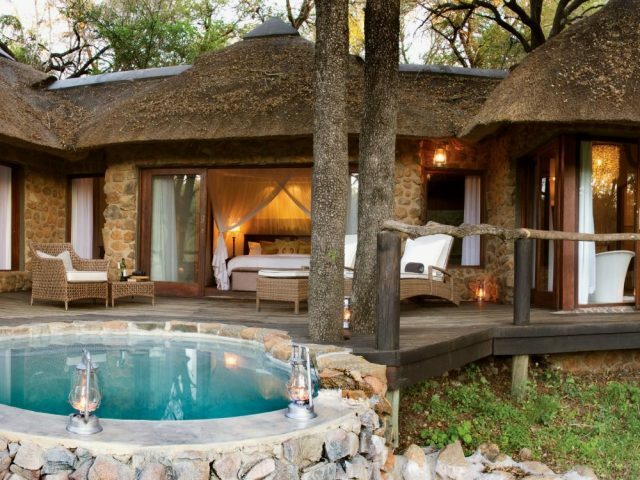 This is the top-of-the-range lodge amongst the reserve’s 4 varied lodge options and is squarely targeted at the premium end of the market traveller that demands the very best! When initially built Karula was virtually split between tented rooms and more conventional suites – flood damage a few years ago sawhowever has seen Kapama take up the opportunity to replace all of the tents with more of the upmarket Villas and take our word for it, they're definitely some of the most attractive rooms of any South African game lodge! So what makes the various rooms at Karula so special? For us it’s the way that the neutral colours, wood and African décor have been fused with subtle lighting and open spaces, making the most of the natural light and views – but what we definitely love most is the stunning, blonde wood which makes up the dominating stylistic fingerprint of the lodge! It’s not a case of all style but no substance either, and the suites and tents are all well equipped with desirable luxurious touches like Nespresso coffee machines, iPod docking station (not in the tents), Wi-Fi, stunning stand-alone baths and air-conditioning. Breaking things down further, Karula has 12 Villas alongside 2 Family Villas, each exquisitely decorated and with generous private space (the standard Villas measure 130 m² each!) – a highlight is the opulent en-suite bathroom featuring indoor and outdoor showers, his and hers basins, and stand-alone bath. The Villas are wrapped by glass sliding doors, which enable seamless views over the Klaserie River. Perhaps our favourite aspect though is the outside deck area, with a full-size heated swimming pool and sun loungers for relaxation and for tanning on those hot summer days! Two of the rooms at Karula, each measuring 170 m², are purpose-built for families. These Family Villas have an open-plan living room with fireplace which flows into the master bedroom with its en-suite bathroom. The second bedroom also leads off the living room and can be accessed through an inter-leading door or its own entrance – ideal for those teenagers coming in later. It’s perfectly equipped for kids too, with a flat screen TV and Wii console and selection of movies that’ll keep them occupied if they haven’t yet learnt to appreciate the bush! Each Family Villa also has a private outside deck and a large swimming pool, which is heated in the chillier months for year-round swimming – this exclusivity offers you and your family a hideaway treat where you can relax and spend time together, without worrying about the little ones making too much noise. The latest enhancement to Karula is a stunningly attractive Spa (originally Karula guests had to make use of the spa facilities at River Lodge) Surrounded by glass so that you retain a connection to the outside bush even whilst you're enjoying a treatment, its a wonderfully contemporary and stylish facility that will have you purring with satisfaction! Equipped with everything from steam room and ice bath to rasul, couples will no doubt love the signature "Pinotage Bliss" bath treatment in twin standalone baths overlooking the bush! Another favourite of ours has to be the large Hydro Pool where you can look out over the bush whilst enjoying the exhilarating jets of water! We’ve raved so much about the lodge’s stylish rooms and public areas that we haven’t even got onto the game aspect - well never fear, as a stay here will deliver the same excellent wildlife experience as the rest of the Kapama lodges! Kapama is home to over 40 different mammal species, including the Big Five, as well as approximately 350 different bird species and a variety of smaller species which also call this natural environment home! The reserve comprises of 13 000 hectares of sweeping wilderness and there are twice-daily game drives where you will be accompanied by expert rangers and trackers who will do their best to deliver superb wildlife sightings. 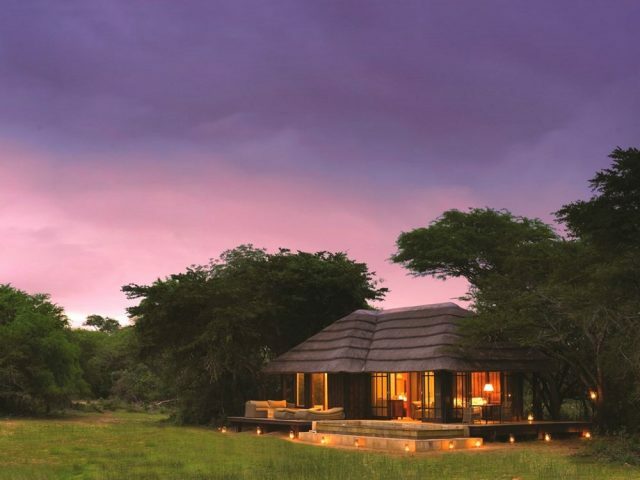 So whether you’re soaking up the comfort and style of the lodge, or enjoying the thrill of encountering big game, a stay at Kapama Karula promises to deliver an unforgettable experience!